Apple has started the free iPhone 4 case or bumper program, if you’re an iPhone 4 owner it’s a simple process to claim a free case or get a refund from a past purchase. 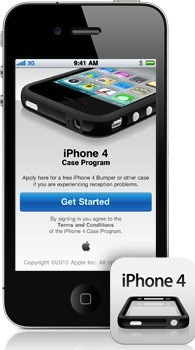 To qualify for the free bumper or case, you must apply to the program within 30 days of buying an iPhone 4, until September 30 when the program expires. The free iPhone 4 bumper and case program is offered in response to the antenna problems that some users have reported experiencing with iPhone 4, which has received a large amount of media attention and subsequently been parodied to death. You can read more on Apple.com’s iPhone 4 case program information. My Android phone doesn’t need a rubberband to make calls !! Its really sad when Apple lies to the public and its worse when the sheep believe the lies!!! !